On Thursday, freshman Rep. Alexandria Ocasio-Cortez and Sen. Ed Markey revealed an outline for a Green New Deal program, calling for a "new national, social, industrial, and economic mobilization on a scale not seen since World War II and the New Deal." Some of the proposals have already been implemented over the course of the last several years, with government support for programs like making buildings more energy-efficient and training workers with green skills. And of course, the terminology used for the proposal is even older, harking back to President Franklin D. Roosevelt's New Deal, which put unemployed Americans to work (including with environmental jobs) during the Great Depression. Ocasio-Cortez and Markey hope - though how they would do so is unclear - to likewise create government jobs while also helping the planet. Similarities between the two New Deals don't stop at their names. The modern calls for focusing on upgrading infrastructure and for "smart" power grids echo the work of the original New Deal's Rural Electrification Administration, which brought electricity to rural areas. The call for "reducing the risks posed by flooding" recalls the Tennessee Valley Authority (TVA) supervising the construction of dams for flood control, and the call for construction that safeguards people from extreme weather events recalls the planting of a "shelter belt" of trees to break up the powerful winds that contributed to the Dust Bowl. And the New Deal's Civilian Conservation Corps (CCC) employed about 3 million men in what might today be called green jobs, including carving park trails and fighting wildfires. When the CCC disbanded in 1942, TIME said it had "one of the best records of all New Deal hopefuls" and that "[the] most rabid opponents of New Deal spending admitted that CCC was worthwhile." These programs made a big difference for the land, as well as for the people they employed: A 1946 report found that New Deal projects built or upgraded 650,000 miles of roads, more than 125,000 buildings, more than 16,000 of "water mains and distribution lines," and more than 24,000 miles of sewerage facilities. Also thanks to the New Deal, nearly 220 million trees were planted by the 1940s and about 9 out of 10 farms had electricity by 1945, according to the Roosevelt Institute. 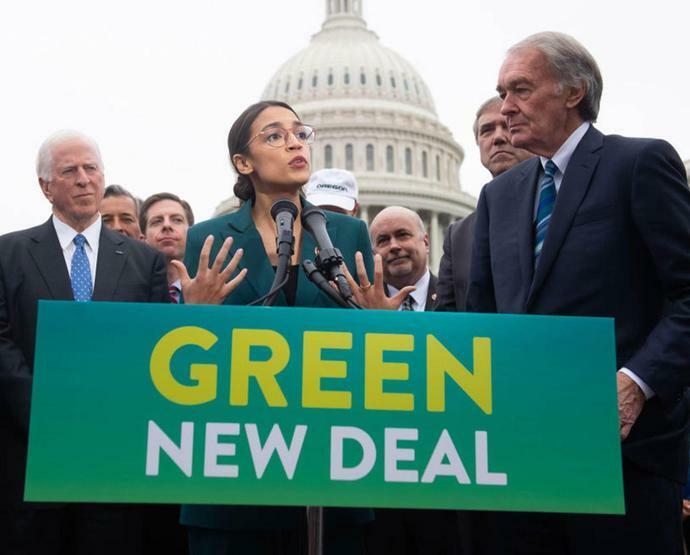 Those numbers may be seen by advocates as a boost for the possibilities of a Green New Deal, says David B. Woolner, Senior Fellow and Hyde Park Resident Historian at The Roosevelt Institute and co-editor of FDR and the Environment. After all, they're proof that environmental change on a grand scale is possible under the circumstances. "We tend to think these green-jobs programs are beyond the reach until our economy is up and running at a proper pace - too expensive, can't afford it," he says. And yet the New Deal was implemented at "the worst period of economic crisis in America's history." Some of those problems are economic, having contributed over the long term to the need for further job programs. For example, government housing policies that amount to a "state-sponsored system of segregation" have roots in New Deal programs, as Richard Rothstein of the Economic Policy Institute, once said. His book The Color of Law points out that The Public Works Administration (PWA) created the first civilian public housing in response to a housing shortage, but that housing implemented segregation even in neighborhoods that had previously been integrated. The CCC and TVA had separate, less comfortable housing for non-white employees, and though the the Federal Emergency Relief Administration did employ African-Americans, the agency only gave them the worst-paid, low-skill jobs. Decades later, racial inequalities in housing and wealth endure. Green New Dealers vow to help those who weren't helped during FDR's administration. As the proposal's official outline puts it, "Federal Government-led mobilizations during World War II and the New Deal created the greatest middle class that the United States has ever seen, but many members of the frontline and vulnerable communities were excluded from many of the economic and societal benefits of those mobilizations." "This whole suburban boom has been at the center of our really unsustainable lifestyle, automobile dependence [and] sprawl," says Peter F. Cannavò, a professor of government at Hamilton College who's an expert on environmental politics. And on a fundamental level, Cannavò says, there's something about the current challenges facing the planet that the New Deal did not leave Americans prepared to face. Programs like the TVA instituted major changes that affected lives and landscapes, but at a scale that seemed comprehensible and controllable. Today, although not everyone in Congress believes that human-caused climate change is real, it's clear to many that the problem is at a scale that even something like the New Deal - though it fundamentally altered the relationship between the U.S. government and citizens -would not be enough to completely fix things on its own. Those who support the Green New Deal can only hope that their proposals will help. "Conservation efforts in the '30s came from the top-down; there's a sense that we can control resources," says Cannavò. "Now with climate change, with the modern environmental movement, [there's] a sense of humility."